Last weekend was the annual white truffle festival in Amandola called Diamanti a Tavola or Diamonds on the Table. 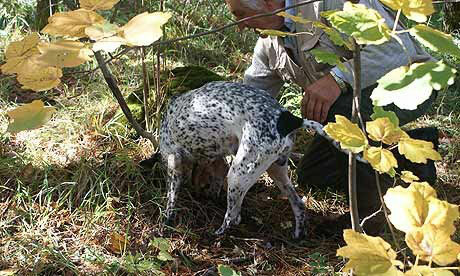 Visitors and locals alike could book into truffle hunts with the hunters and their dogs as well as guided walks in the Sibillini Mountains. In town, Via Indipendenza, which winds it's way up into the town's historic centre, was lined with stands selling local products, the pink apples, pasta with truffles, vino cotto and more. In the cloisters next to the church of Saint Francis were exhibitions of mushrooms and vendors selling white and black truffles. In Piazza Risorgimento, a restaurant was set up where you could sit down to enjoy dishes made with truffles and a glass of wine or two. Diamanti a Tavola is truly one of the best festivals of the year.